The new year is here and many of us will be making promises about improving our language skills in 2019. However, how many of our children think English is as much of a priority as we do? The English language is becoming more and more important – both in education and at work- and now there are more English speakers in China than in the USA! But do Spanish schools give children the support they need to be able to travel, work, or study in English after they leave? 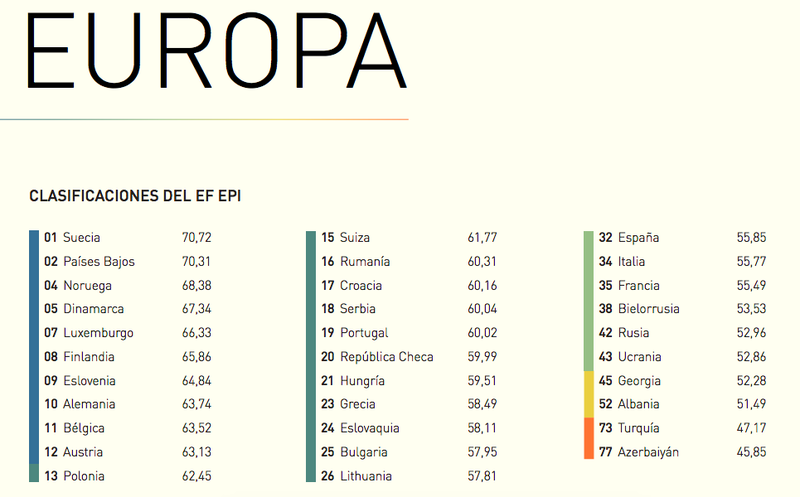 In 2018 Education First (EF) showed that Spain ranks 32nd out of 88 countries worldwide for general English proficiency, which seems quite good! However, in Europe they are 23rd out of 32. That’s a long way behind other European countries like Sweden (#1) and the Netherlands (#2). 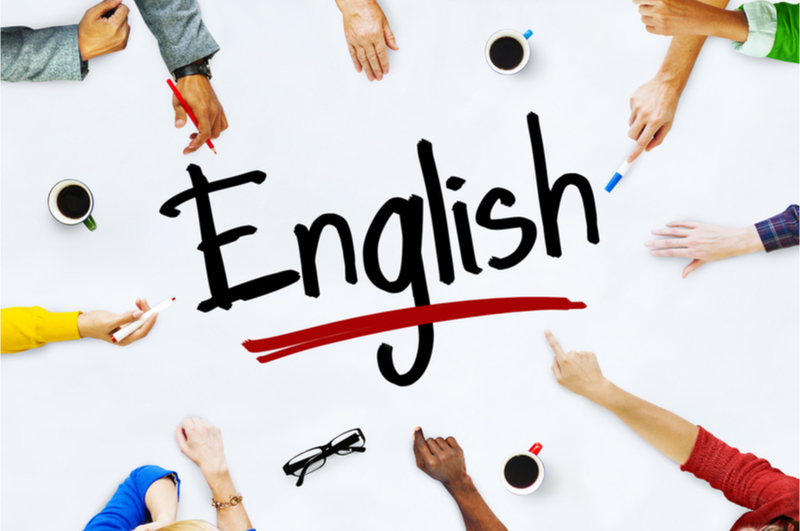 A new report by EF has come out detailing the English reading and listening proficiency levels of teenagers and young adults worldwide, helping to explain the reasons behind these statistics. This article will help explain the findings of this new report, what it means for you and your children, and also how Oxford House can help. What is the EF report? 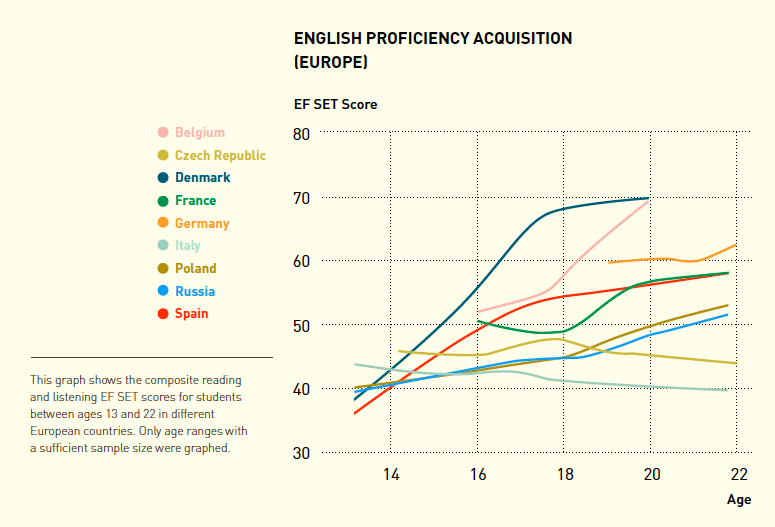 Released in 2018, the EF English Proficiency Index for Schools (EPI-s) has worked with hundreds of schools in 26 different countries and measured the reading and listening proficiency levels of their students. They have also done research with students at hundreds of universities, to help measure how teenagers get on with their English once they start focusing on their degree. How different countries compare with the listening and reading proficiency levels of their students at lower secondary school (age 13-16), higher secondary school (age 16-18), and university (age 18+). Whether or not there is a difference between the listening abilities or reading abilities of the students. If these proficiency levels change over time, as the students go through these different years of their education at school and university. What did the report show? 1. First of all, the report shows us that students in Spain, in general, make really good progress with their English skills in lower secondary school, but in upper secondary school this slows down a lot. 2. Interestingly 13-year-old students in Denmark have very similar levels of English to students of the same age in Spain. However, from the age of 15 to 18, the Danes make much quicker progress, and leave school with the best English abilities in Europe! 3. In a similar way, when you compare students from Belgium and Spain at the age of 18, when they graduate from school and head off to university, we can see that they are almost identical in level, but while at university the students really flourish in Belgium compared to Spain. 4. Finally, at both secondary school and university, there is a big difference between the reading and listening skills of the students. In fact in Spain at the age of 15 the average reading level is A2+, but for listening it’s a B1+, a whole level higher! How can Oxford House help? Our T3 and T4 exam preparation courses are designed to give teenage students an excellent foundation in all the four English language skills – speaking, reading, writing, and listening. This can then help them perform well in exams, such as the Cambridge B2 First (FCE). These courses are suitable for younger teenagers (usually around 13-15 years old). They help make sure that your children keep making good progress in all of the skills, and don’t get left behind by other teens in Europe, such as Denmark. When teenagers reach 17 – 18 years old, they have a lot of pressure to do well at school in all of their subjects, to help them get into a good university. This means that English probably won’t be their priority, and maybe why the report shows that they make slow progress at this time of their lives. By signing up to one of our T6 or T7 courses for older teens, we can help your children focus on their language skills as well, pushing them to achieve a Cambridge C1 Advanced or C2 Proficiency certificate, which will give them a really good head start at university. There’s no doubt that university is often the best time of our lives, with much more freedom than you had at school, and a really good learning environment. However, as the report shows for students in Belgium, if you’re able to focus some of your time here learning English too, you can end up with a really high level when you leave. This will, of course, help when you’re looking for your perfect job afterwards, in Spain or abroad. Our adult General English or Cambridge Exam courses can easily fit around your university schedule, and with our excellent teachers and fun learning environment, you can really make the most of your years at university. Our 9-month Extensive courses usually start at the beginning of October, but it is possible to join at any time of the year, depending on availability. We also have 10-week Intensive courses, which begin at the start of every semester, if your objective is to progress as quickly as possible. If you would like to know more, come into the school and one of our experienced level testers will be able to advise you on the best class and level for you or your children. Come out (pv): to be released to the public. Get on (pv): to perform or progress over time. Find out (pv): to discover new information. Slow down (pv): to go slower over time. Head off (pv): to go to. Flourish (v): to develop really well. Make sure (pv): to guarantee/ensure that something happens. Leave behind (pv): to make slower progress than other people. Sign up to (pv): to register or subscribe to something. Head start (n): an advantage at the beginning of a process. End up with (pv): o finally be in a place or a situation.